Like I asked before, how long does it take to smock a baby bishop? One transatlantic flight and a layover. The only thing missing are the bullion roses around the bottom. Those are almost done now. Here it is waiting to dry after I blocked it. A close up of the smocking. My daughter wanted an ecru and white bishop similar to one she has seen on Sara's blog. And I realized I had not done a bishop for the baby yet. This one was pleated already so I pulled out my trusty Anchor color card to choose floss colors. 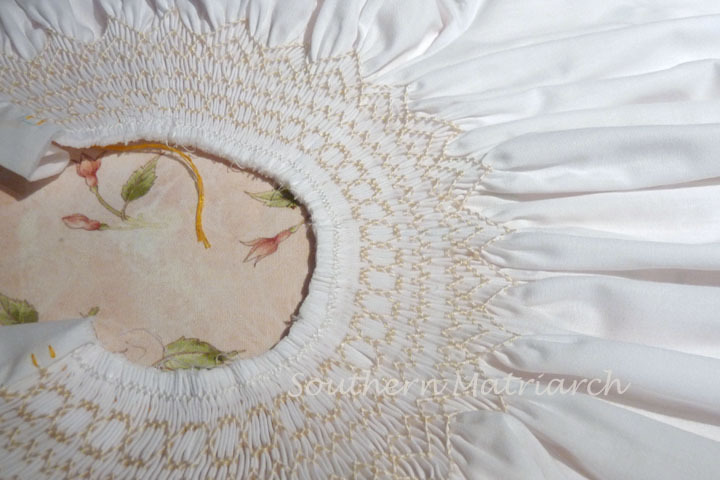 Since I didn't have a lot of extra time when I was preparing to leave town, I used a kit I had purchased a while back from Australian Smocking and Embroidery. The dress is called Beginnings from issue #73. It is a poly/cotton fabric. I love using Swiss voile, Swiss Batiste etc, but sometimes I think a new mommy might appreciate something a bit more wash and wear. This mommy is not adverse to ironing, but everyone needs a break now and then. An added bonus? This design stitches up crazy fast! So I am off to finish up the roses and do construction. How pretty. I love the white and ecru color combination. I've never purchased one of the kits, but it seems like a good idea. Prettiful! I actually have a picture of a white with ecru bishop printed and in my wee care inspiration pile. Love it! How pretty! So glad that you had a wonderful trip! I have never got that "while we travel" smocking thing down. Maybe I need to give it another try! Absolutey beautiful! I love that pattern, too. Great job! That is really sweet, Martha. I have made that bishop and liked how it came out very much. Imperial batiste bishops are great for every day wear. Paige had a few when she was little and I never had to worry about what to put on her in a hurry so she would look cute. Bald headed babies need to wear dresses ya know? Love white and ecru. So pretty! I love a white bishop! Sounds like you're having a wonderful trip! Love Imperial Batiste for babies. With carseats & wrapping up of sweet babies, the cotton blend is wonderful. Well you are the queen of smocking and bishops. I tell you, you have an eye for this. I do not smock so I cant tell you how long it would take. I tried to smock but its not for me. So I guess my answer would be "Forever". Gorgeous! Your thread has a lovely sheen. Is that photography or something other than DMC? 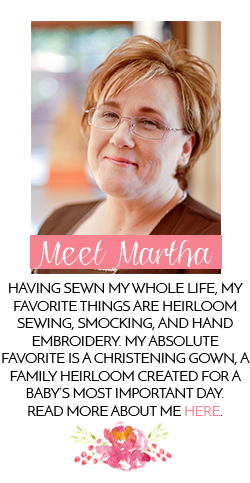 Beautiful as always, Martha. Ecru/white are my favorite combination too. It always look so elegant. 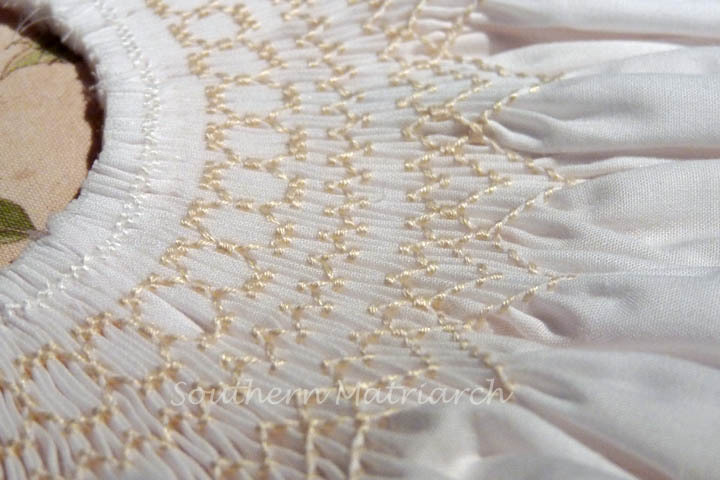 Perfect smocking. I'm impressed you could do that while traveling. Thank you everyone. The bullion roses are done and I am ready to add the neckband/piping. Bunny it is Anchor floss. Anchor has a nicer sheen than DMC. Plus I use a large needle which helps reduce on my floss. I would not have thought that smocking could be a take-along proj!ect. Gorgeous! But everything you do IS gorgeous! I'm a little confused by this however: "Plus I use a large needle which helps reduce on my floss"
I suspect there's a word missing after "reduce"? so if you have a tip for the rest of us, please bring it on!!! Designdreamer, That should say helps reduce "wear" on my floss. I use a 7 crewel or 7 darner. THe larger hole allows the floss to glide through with less wearing on the thread, thus retaining the shine of the floss. your work is beautiful! I am impressed it only took you one flight! 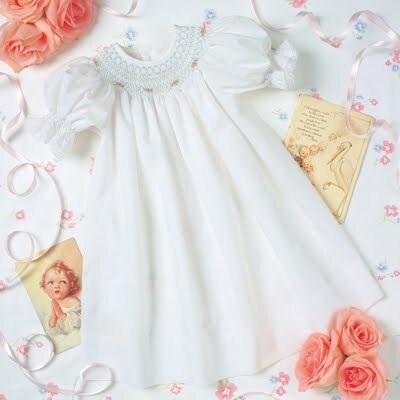 I have only made one and smocking it was a very long process! I am looking forward to seeing your dress complete!